The Arkansas River was flooding...the rain finally quit...and it was HUMID...welcome to the Easter Seals Rock Run 8K!!!! 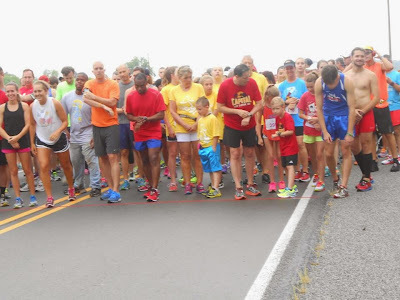 For the first time in a good while, Braden was feeling 100% heading into a race (his previous three races involved upchucking before, during, or after a race), so it was nice to see him completely healthy for the Rock Run. In preparing for the race he ran a 55:47 10K on one training run and then four days before the race, he clocked a 25:29 5K, which was a PR by 1 minute and 6 seconds off his best 5K race time. The only thing we were concerned about going into the race was if the course would be flooded and if Mother Nature was going to cooperate with us. All week long, including 24 hours prior, the weather forecast was constantly changing and right before race time the light rain that preceded it stopped. 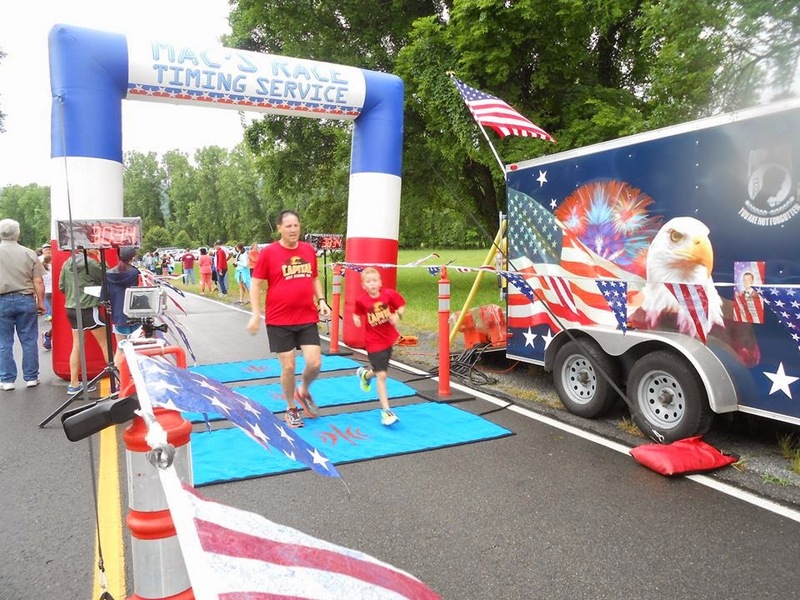 The first mile of the race was going great and we were maintaining an 8:27 pace with the cooler temperatures, but the next three miles were arduous. The humidity started to kick in, and with that our pace steadily got worse with each mile. Our splits were the following: mile 2 was at an 8:40 pace, mile 3 an 8:53 pace, and mile 4 was a 9:04 pace. I never hit the water stations on a 10K or shorter distance, but the last watering hole at mile 4 couldn't come soon enough for me and the boy! Once we got some water and he knew we had a mile to go, Braden put it into gear and finished the last mile at an 8:18 pace. We finished with a time of 43:21, which was only 41 seconds off our goal time, but taking into account the humidity, I felt like he did an excellent job! If it wasn't for the humidity, I know he could have definitely finished below our goal, but we were fortunate that the sun did not come out, or his time could've been worse...it was really draining. With his result, Braden came in first place in his age group and he also claimed the maximum of 20 points for the Arkansas Grand Prix since it was a non-championship race! He now has opened up a pretty good lead in the standings and his next race will also be a non-championship run at the Arkansas Runner 2 mile event in a couple of weeks. He will have a lot more competition at that race since it's a shorter distance. I'm excited to announce that Braden officially belongs to two running clubs after joining the Arkansas Performance Running Club Patriots! 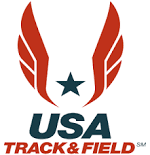 Even though Braden has been practicing with his new club for about a month now, I thought it was worthwhile to pay the monthly costs to join so he can get trained by a coach and run in U.S.A. Track & Field events on a local, regional, and potentially a national level. Head coach Cezar Terlea and his assistant Krista Hawkins work really well with the kids and I've noticed how Braden's times have really come down in the middle distance events he is running. Interestingly, I wasn't pursuing anything USATF related, but after we ran the Capital City Classic 10K in 55:08, Coach Cezar was at the finish line to greet us. He asked how old Braden was (6 at the time), then he gave me his card and asked me to give him a call. Initially I was skeptical, but after making a few phone calls I found out that he was legit and that some of the top high school track athletes in the state run in the club. I take Braden down to the UALR track once a week to train and I think that even he amazes the coaches with his stamina because he runs just as many 150M and 300M iterations as the high school kids and his times are just as consistent from the first to the last iteration. 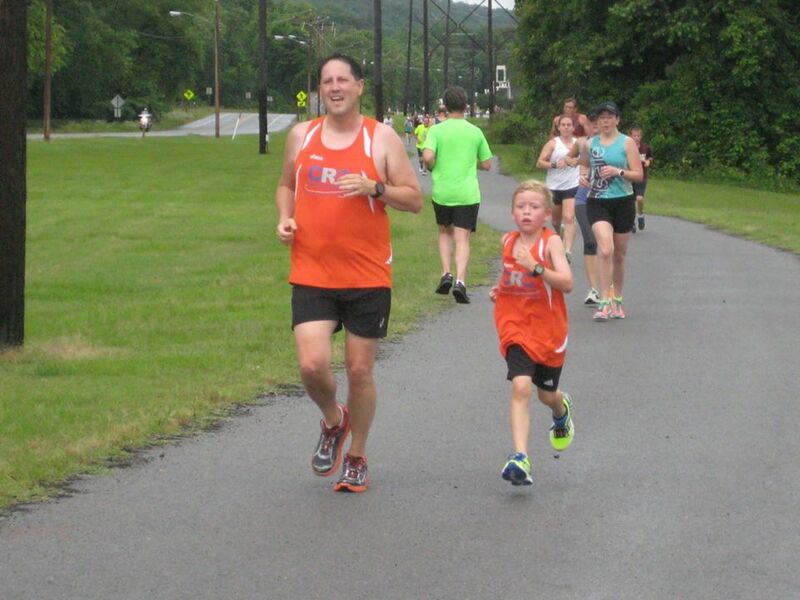 The coach sometimes looks at me and questions if Braden can keep the pace up and I tell him that he is used to running 10K races, so 2-3 mile training events are easy to him, and Braden proves me right every time. The coaches and older kids are always complimenting him on his stamina and his endless motor. 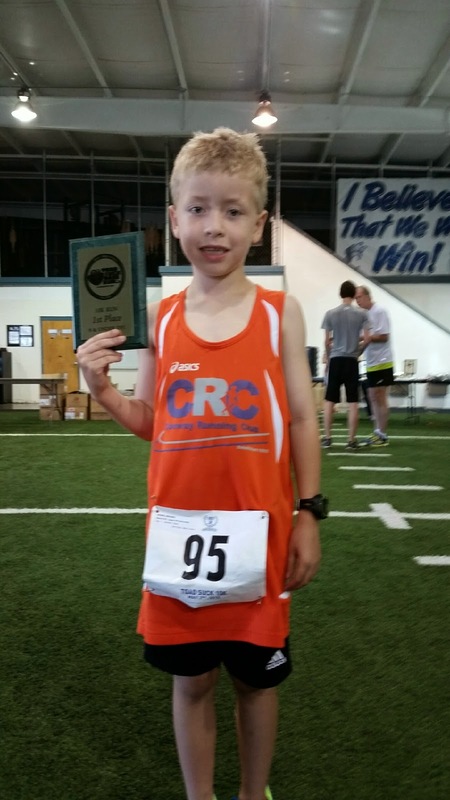 On June 20, Braden will run in his first meet at the USATF Arkansas Association Junior Olympic Outdoor Track and Field Championship in Little Rock in the 7-8 year old age division. To confirm which events Braden should run, Coach Cezar timed him in the 800M and 1500M runs. Braden first ran the 1500M event and finished with a PR time of 6:57 and then 25 minutes later ran the 800M run in 3:33, setting another PR in that distance as well! The awesome thing is that with some work Braden's times could actually qualify him to run on a national level! Would he win? Not a chance, but at least he could get to a level where he could challenge on a regional basis and maybe one day compete against the big dogs. Originally, I was just wanting him to join the club so he could compete in Junior Olympic Cross Country events, but the track and field side has opened up some other doors. 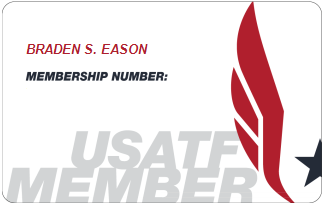 So now, Braden not only will be running Arkansas Grand Prix races, but USATF meets as well. I think our schedule and vacations are now going to revolve around Braden's running! Cindy and I are truly thankful at the way the Lord has blessed Braden and we know with his running abilities and his smarts (he's a straight A student), that many opportunities will come his way as he gets older. Until then, I'll just enjoy the ride and run with him as long as I can until I can't keep up with him anymore...which may be sooner than I think!! 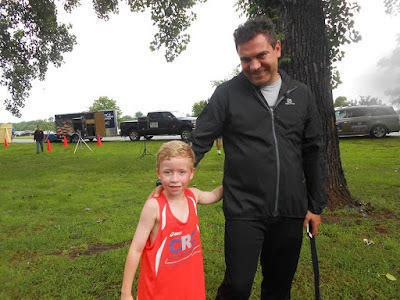 This past weekend Braden and I got to run our first race together in a little over a month at the River City 5K in Little Rock. I had been working out the kinks in my Achilles area and building my distance and times back to where they were before the injury and Braden was hoping to get a new PR with his brand new running shoes. Everything was going great in preparing for the race. A few days before the race on our last 5K training run, Braden ran a 26:48, which was only 13 seconds off his best time, and it was all I could do to keep up with him because I was a little tired from running over the previous four days. 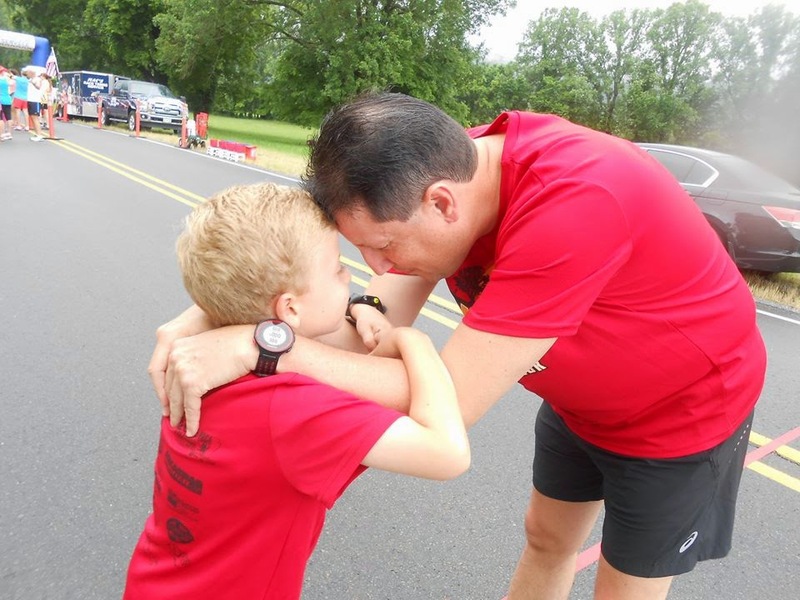 I was glad to see him do well on a training run with all the allergy and coughing fits that he had over the past few weeks and we both felt confident that he would do great at the race. Unfortunately, things didn't go the way we had planned. The night before the race, something didn't sit well with his stomach and he threw up the blackberry pie he had for dessert that evening. When it was time to get up, he didn't want anything to eat, but he said he felt good for the race. The race time temperature wasn't too bad, but it was a little humid. We got off to a great start and Braden was running great, but then a little before the 1 mile mark he said that his tummy wasn't feeling that good. We basically labored the rest of the course, stopping and starting several times with plenty of walking, and finishing with a time of 30:33. It stinks because, for the first time in a while, his training was terrific, but because of some pie, he didn't get the run that he wanted (lesson learned...no desserts the night before a race!). Despite all that, he did finish first in his age group and for the first time since I've run with him, I got to place in my age group with a third place finish. 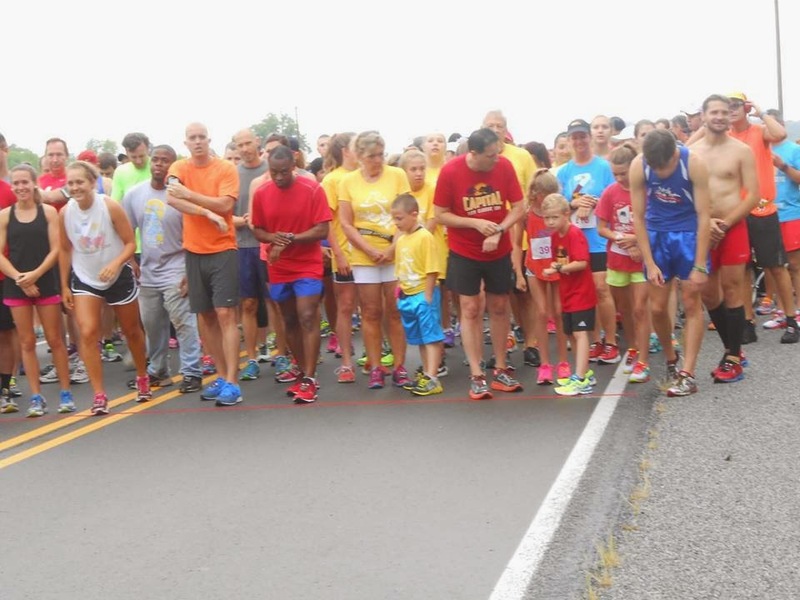 Our next race is the Rock Run 8K in less than a couple of weeks and it will also be a Grand Prix non-championship race as well.